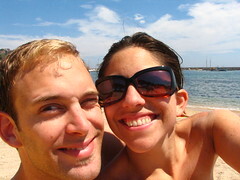 On the beach at Calella de Palafrugell, Catalunya, Spain, in 2005. We’re Amy and Jonny (Amy’s American, Jonny’s English) (see us, smiling/squinting at left). We love to eat and we always go out of our way for good food. This blog covers our border-line food and drink obsession through anecdotes from our travels, life as working parents of two young kids, our weeknight meals at home, and special occasion dinners out. We write about the food we want to write about. Occasionally, we will cover a cookbook or a product, but we have never been paid for promotion and we’ll always tell you if we actually liked the product or not. That’s not to say we wouldn’t like to be paid for it, it’s just that, like many a great artist, our genius is yet to be fully recognized at this point. We’ve been blogging at WANF since April 2007 and in that time have covered quite a bit of ground. Feel free to check out our Recipes page or use the search function to look for things specifically. The tag cloud is also a good way of finding what you’re looking for, and if all that fails, click here to drop us a line. We always respond, even if it takes a couple of days. This is a blog not a job, remember. We are delighted to have been selected among the fabulously diverse group of bloggers whose content is syndicated to the Christian Science Monitor’s “Stir It Up!” food blog. We’re delighted to have been invited to be regular guest bloggers on ReadyMade.com. We are contributing a series of “how-to…” posts a couple of times a month. We are excited to be doing this and grateful for the opportunity, so please check us (and the other great contributors) out there too. Kind a lengthy addition to our post on Au Pied de Cochon, and a written version of our podcast here’s a Montreal, Canada, city guide we penned that was published (with the wrong photo of Jonny) on online travel resource site TravelSort.com. The header pictures/banners above are all taken by us on our travels to Spain, Italy, France, England, Canada, Argentina, Uruguay, and around the U.S., and never fail to make us salivate — especially the raw meat! Check our Photography page or our Flickr Photostream for more pictures from our travels. If you’d like to use any of them in your publication, please drop us a line – we usually say yes. This website runs a heavily modified version of MistyLook-2 sidebars on the very wonderful WordPress 3.3. Our host is Dreamhost, whose services have improved a great deal since they provoked this outburst. Podcasts run on Podpress through Libsyn – the best $5 we spend every month. @Amanda – unfortunately, we haven’t got a recipe for it – it’s a kind of pineapple upside-down cake, right? – but thanks for your message! We tend towards the savory rather than the sweet mostly, but our good friend Elra over at Elra’s Baking may be a better place to look as she makes all kinds of wonderful and unusual cakes and breads. If you do happen to find a good recipe for bizcocho de pina, please do feel free to share it with us! I am Antonio. I am approaching you with the purpose to introduce myself and my new services of catering and Culinary Arts. I would be delighted to further explain you the philosophy of my company as well as any other question you may have. Over the last several weeks I have been following your blog and believe it to be very appealing. Perhaps you can find a way to include some of my dishes, recipes or, even better, showcase my services and company. Garlic & Parsley’s. “Mediterranean flavors”. Home made food catering service. @Maureen: glad you enjoyed it and thanks for visiting us all the way from Melbourne, Aus! Just stumbled upon your blog. Had me laughing like a child, Loving it! I am a researcher and production assistant for Leopard Films in NYC, and we are working on a new show for Cooking Channel. I notice your Contact link does not work, and would like to be able to chat with you some more about the show. Email me back if interested!